Groups that saved town halls across Moray from closure last year have vowed to reach out more to communities in order to thrive. Six of the venues – along with two community centres – were passed to newly-formed local management teams in the summer after the council admitted it could no longer afford to run them. The handover came with the promise of cash support to cover the running costs for the first six months of the lease. However, that help expired at the end of last week – meaning the groups of volunteers now need to generate enough income to pay the bills and keep the doors open. For some those demands will be hefty, with Elgin Town Hall’s target for the next 12 months likely to be more than £150,000. The venue’s board has praised locals for backing it by continuing to buy tickets for events, while also booking it for functions of their own. 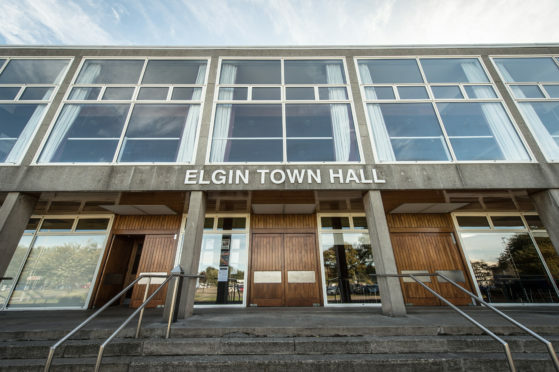 But Mike Devenney, chairman of Elgin Town Hall for the Community, has acknowledged there is still more that can be done to meet the challenge – including the question of whether the group should bid for ownership of the building. He said: “As all board should, we recently took time out to reflect on our first six months and exchanged thoughts on our successes but also on where we need to improve. “Arising from this, we have agreed that we must do more to work with our members and will be calling a meeting later this month. Initiatives to build the amount of volunteers to support the committee and two hall keepers are expected to be launched in the coming months, while there are also plans being drawn up to tap further into the wedding market. Meanwhile, the Fishermen’s Hall in Buckie has also been on a recruitment drive for volunteers to help run events and keep the venue clean. Already a retro 80s disco and a show featuring a hypnotist and magician have been added to the programme that will be hosted by locals.